statement where the new spokesman, Lanre Issa Onilu, described some governors of the Party as Bad Losers with regard to the party’s primaries. The angry governor, in a statement signed by Sam Onwuemeodo his Chief Press Secretary, said; ‘We have read in the media certain statements credited to the Acting National Publicity Secretary of All Progressives Congress, APC, Mallam Lanre Issa Onilu, in which he described some governors of the Party’s extraction as bad losers with regard to the Party’s Primaries. He named Governor Okorocha as one of such bad losers, and never exercised caution in talking about the situations in the affected states. ‘As the Acting National Publicity Secretary of the Party, Mallam Onilu would have first and foremost appreciated the fact that both the National Chairman, Comrade Adams Oshiomhole and the governors are all partners in progress with regard to the fate of the Party. They are all major stakeholders who can at times disagree to agree. So, in handling issues concerning the National Chairman and the Governors, the Acting National Publicity Secretary would have struck a balance to avoid giving outsiders the impression that there is an on-going war between the Chairman and the Governors. 'On the issues he raised about Imo State especially concerning the governorship ticket of the Party, we only advice that he should endeavour to have the existing facts to avoid feeding the public with the wrong information, that may also cause problem in the State. ‘Chief Hope Uzodinma went to Court over a primary he knew that never took place. The Court refused to grant him any order as requested but rather invited APC, INEC, etal, to come and explain why Uzodinma should not be granted the reliefs he had asked for. ‘In the case of the National Assembly, the only worry by APC members in the State is the automatic tickets given to a Senator and three House of Representatives aspirants who claimed to have joined the party in Abuja few months ago. And these people given these automatic tickets know that they can never win election in Imo with the tickets of APC without the support of Governor Okorocha. ‘We are also aware of all the claims and Counter-claims in Abuja by some Abuja based Politicians from the State. 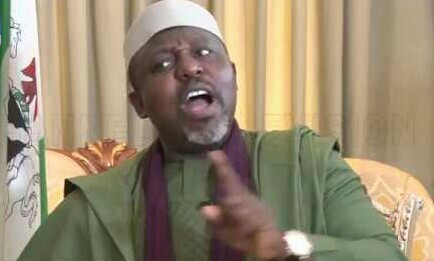 We are yet to know how anybody can win election in Imo on the platform of APC without Okorocha’s support. We won’t go further here. The inscription on one vehicle in Owerri is “time will tell”.